How Much Paper Does it Take to Stop a 50cal? Today we are going to find out how much paper it takes to stop a .50 cal round! But let us start with some information about the .50 cal round. 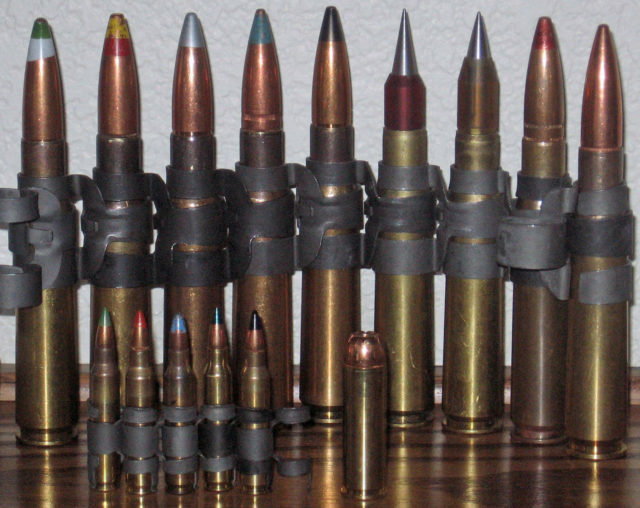 A selection of .50 Cal rounds with different functions, armor piercing, incendiary, tracer, spotter. .223 rounds in front, and a .500 magnum round for size comparison. This awesome pic is by English Wikipedia User Aki009. The .50 Browning machine gun (or .50BMG) is a type of cartridge specially designed to use with the Browning .50 caliber machine gun that was produced in the 1910’s. This round officially entered service in 1921 and is based upon a scaled-up version of the .30-06 cartridge. This cartridge has been produced in a wide range of choices (armor piercing, tracer, incendiary, regular ball and sub-caliber) and the rounds that are intended to be used with machine guns are linked together with metal links. The idea for this particular round came during World War 1 from John Browning, as they required something to be used as an anti-aircraft weapon. APIT rounds (or Armor-Piercing Incendiary Tracer Rounds) were super effective when used against aircraft, and normal Armor Piercing rounds, as well as Armor Piercing Incendiary rounds, were best used to destroy structures, bunkers made of concrete and lighter air force vehicles. Both incendiary rounds left a report, flash and smoke upon contact which was highly useful to detect strikes on the enemy targets. “M82A1 Barrett” by Heavennearth – Own work. Licensed under CC BY-SA 3.0 via Commons. During the 1980’s the Barrett M82 .50 caliber rifle and other variants were created and had become upgrades to military snipers. A sniper that is skilled can quickly and efficiently neutralize an infantry unit by eliminating key subjects or targets, all without disclosing his own position. The .50 BMG cartridge is also utilized in other sniper rifles and long-range target rifles. Canadian Army Corporal Rob Furlong used a McMillan Tac-50 .50 Browning machine gun sniper rifle to accomplish the longest-range sniper kill (confirmed kill) during the Afghanistan War, at that time. He shot a Taliban fighter in 2002 at a distance of 2,657 yards. This personal record was beaten in 2009, again in Afghanistan, by a sniper who was British using a .338 Lapua Magnum rifle at a distance of 2,707 yards. Check out the video below! These guys love their guns, and here they test out their new firepower to see how much paper it takes to stop a .50 cal round in its tracks. Over to you, guys!